Decorating your home bar, office, study, summer cabin, beach or lake house? This antique looking decanter is a cool addition to any space, making it feel customized and cozy. With a real wood stand and sterling silver faucet, this high end artisan decanter is just what you need to complete your favorite room. This nautical novelty decanter set is great for outdoor and travel lovers as well as retired marine and navy men. The intricate glass blown full rigged ship inside is in full sail, transporting you and your favorite adult beverage back to the sea and the beauty of the ocean. Four matching glasses rest neatly on the base of the decanter, decorated with an etched world map design to further entice your travel lust. Modern and rustic this whiskey decanter is a great housewarming, birthday, retirement, or fathers day gift for dad. With a smooth plain glass barrel and intricate glass art inside, this set is good, personalized gift for that alcohol imbibing, travel loving person in your life. Do something different with your wine when you serve and display it in this beautiful, aerating decanter. Break out that moscato, merlot, and all your other wines, putting your best one on display. Reds work especially well in our decanter as they serve best at room temperature and need time to breathe before serving. With an included glass stopped, this lead free decanter is especially great for storage of your favorite liquors like cognac, rum, or scotch. 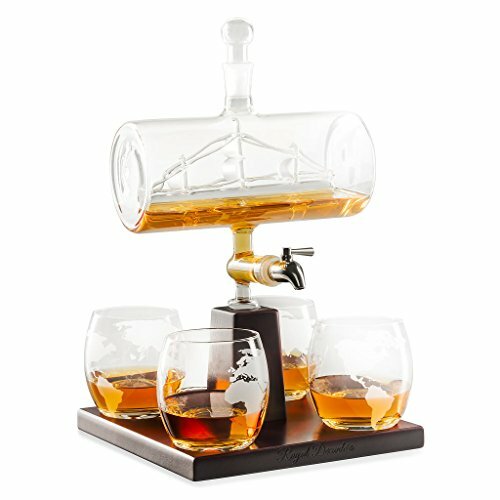 This custom whiskey decanting set includes a wide wooden base that functions as a tray holder for your 4 vintage looking etched globe liqueur and wine glasses. If you have any questions about this product by Royal Decanters, contact us by completing and submitting the form below. If you are looking for a specif part number, please include it with your message.